Ranked choice voting (RCV) allows voters to rank candidates in order of choice. If your top candidate can't win, your vote counts for your next choice, until someone wins with a majority. Utah passed legislation earlier this year to allow cities to pilot ranked choice voting. A presentation was given at the September 25 work meeting. Cities can opt into an RCV pilot program. 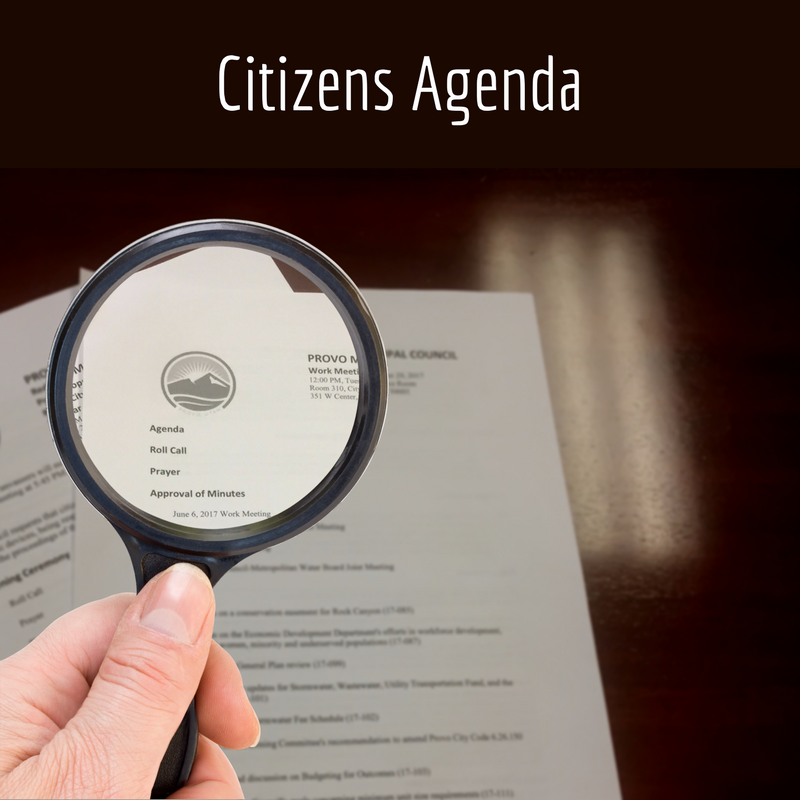 The opt-in is nonbinding, but cities must declare their intent in a letter to the Lieutenant Governor by December 31, 2018.
scheduled for the December 11, 2018 Council Meeting. A motion that the Council commit to have a discussion at a later point regarding an exemption for low income housing and criteria for the necessary City ordinance and that the Housing Committee prepare a recommendation, but that the discussion not delay a vote on the impact fees at the December 11, 2018, Council Meeting was approved 6:1, with Kay Van Buren opposed. A motion to change the implied motion to reflect an effective date of July 1, 2019 was approved 5:2, with George Stewart and George Handley opposed. present value calculation of the State loan vs. traditional revenue bonds was approved 7:0. Ranked choice voting allows voters to rank candidates in order of choice. If your top candidate can’t win, your vote counts for your next choice, until someone wins with a majority. Utah passed legislation earlier this year to allow cities to pilot ranked choice voting. A presentation was given at the September 25 work meeting. Cities have until December 31 to indicate to the State if they would like to utilize ranked choice voting in the 2019 election. Erica Gaddis from the State Division of Water Quality will be here to present on the recent updates to requirements. In FY 2016, the Municipal Council appropriated $35,000 to fund an urban deer removal program on an interim basis. On May 15, 2018, the council evaluated the program and voted to extend the program for an additional year. In that motion, the council recommended the funding be included in the FY 2019 budget. Through the changes that were made to the budget, that change was not incorporated into the new-year budget. The annual cost for administering the program last year approached $20,000. The request before the council is to appropriate an additional $20,000 to fund the FY2019 portion of the program. Provo City Code prohibits self-generation of electric energy unless the generation is licensed by the Provo City Energy Department. Additionally, licenses for electric self-generation by industrial and commercial customers have only recently been authorized by the code. Because self-generation without a license it prohibited, such generation would not qualify for any rate or bill credits. However, with rising interest in self-generation by residential, commercial, and industrial customers, the Energy Department believes it would be prudent to add language to the code explicitly stating that entities that engage in unauthorized self-generation shall not receive any rate or bill credits. There is a clear cost of growth in any community. A city's infrastructure provides a given quality of life in a community, and growth can put strain on that infrastructure. Water, electricity, sewer, street systems, and more must be modified to address the needs resulting from new growth. State law provides a mechanism, called impact fees, to collect funds to offset the City's cost of accommodating that growth. 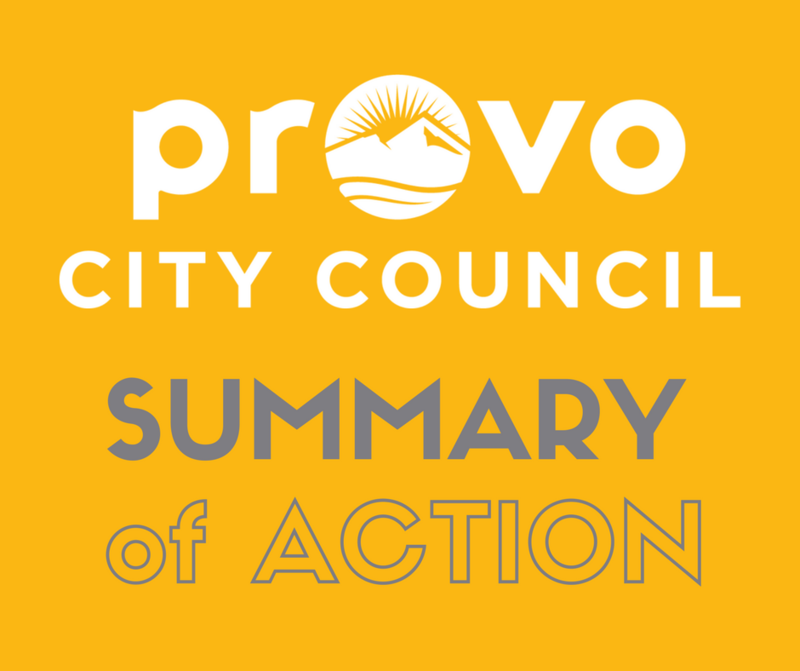 Provo City's ordinance provides that impact fees and capital facilities plans should be reviewed on five year intervals. The Impact Fee Review Committee (comprised of Council members, City staff, developers, and community members) has been meeting since early 2017 and working with a consulting firm to bring forward updated recommendations. The results of their work was presented at an Impact Fee Open House on November 8, 2018. Council will be holding public hearings at the November 27 and December 11 meetings and will then vote on the adoption of updated impact fees. Current impact fees are listed on the consolidated fee schedule. The Public Works Department will come to provide an update to the Municipal Council on the discussions that the Public Works has had with the State regarding a loan for a portion of the cost of this project. They will also update the Council on the location issues that they've uncovered as they've started to narrow the location for the Wastewater Treatment Plant. Finally, they intend to discuss the financing options available to pay for the Wastewater Treatment Plant upgrades. 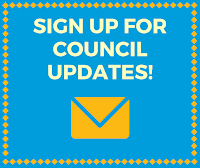 The Council is required to publish a schedule for the next calendar year. A draft has been put together for Council to consider. A presenter from the Division of Emergency Management under the Utah Department of Public Safety will speak to the Council about the option in State Code for municipalities to create a local government disaster fund. Councilor David Harding asked Rona Rahlf, President of the Utah Valley Chamber of Commerce, to present to the Council about the Chamber's efforts on affordable housing. She will also provide an overview of their Valley Visioning initiative. This is a follow-up to a previous presentation on the sewer metering study at the August 7, 2018 Work Meeting. Public Works Director Dave Decker will present and intends to discuss next steps for sewer infrastructure planning and Capital Improvement Program (CIP) project recommendations. Each of Provo’s Fire Stations is equipped with a mechanical system which removes diesel emissions created by the various fire engines and vehicles. Several stations throughout the City have failing systems, which have resulted in costly repairs over the last two years. Facilities and the Fire Department have explored new systems which would be less expensive and more reliable. Fire Chief Jim Miguel will present and share a request for an appropriation which would come to a future Council meeting for approval. Eligible voters may request to submit an argument for or against the issuance of General Obligation Bonds in a principal amount not to exceed $69,000,000 and to mature in no more than 20 years from the date or dates of issuance of such bonds for the purpose of paying all or a portion of the costs of: acquiring, constructing, and equipping in the downtown area a new police and fire headquarters, emergency dispatch center, and city hall; acquiring, constructing, and equipping a new fire station to replace the fire station on Canyon Road; and providing for related improvements in Provo City; and, to the extent necessary, for providing moneys for the refunding of general obligation bonds. In accordance with Utah Code §59-1-1604, requests must be received by September 4, 2018. You may click here to submit your request. Requests may also be filed in person or in writing to the Provo City Election Officer at 351 West Center Street or recorder@provo.org. If you have additional questions, please call 801-852-6524. 1. A presentation on the Congress for the New Urbanism Conference (18-079) Presentation only. An amended motion to keep the General Plan as a Council priority, and to leave control of the process for updating the General Plan to the Planning Commission was approved 7:0. A motion to keep “develop a holistic approach to evaluating zoning enforcement solutions and progress” in the Desired Outcomes, to refer the topic of short-term rentals policy to the Zoning Committee, and to keep Zoning Compliance as a Council priority was approved 7:0. A motion to approve Economic Development as a Council priority was approved 7:0. An amended motion to add “budgets reflect the process and desired outcomes associated with the Council’s and Mayor’s priorities and General Plan goals” and to keep Vision 2050/General Plan as a Council Priority was approved 7:0. A motion to adopt the changes to the Affordable Housing section as presented and edited and to keep Affordable Housing as a Council Priority was approved 7:0. 3. A discussion on a Request for Qualifications relating to the creation of a Community Land Trust (18-081) An amended motion that the Redevelopment Agency proceed with putting out a Request for Qualifications and a Request for Proposals for a Community Land Trust was approved 7:0. A presentation on current Airport projects. Council members are occasionally invited to attend national conferences on topics related to their duties in order to be aware of and informed on best practices and important issues. David Harding attended the Congress for the New Urbanism Conference earlier this year and will be relaying some of the key points that are most relevant for Provo. In January, Council held a retreat to discuss their priorities for 2018-19. Some work was done, but these were not formally adopted as priorities at the time. Council will revisit the discussion and decide how to proceed with setting these items as priorities. A community land trust (CLT) is a nonprofit corporation that develops and stewards affordable housing, community gardens, civic buildings, commercial spaces and other community assets on behalf of a community. “CLTs” balance the needs of individuals to access land and maintain security of tenure with a community’s need to maintain affordability, economic diversity and local access to essential services. The Redevelopment Agency would like to issue a request for qualifications (RFQ) to solicit proposals to develop and manage a CLT. A motion to strike option 2 from the options to be considered and to vote on either option 1 or 3 at the August 7, 2018 Council Meeting was approved 7:0. A motion to update the resolution bond language to include the terms “police and fire headquarters and emergency dispatch center” and “city hall” was approved 7:0. A motion to place the Code changes on an upcoming Council Meeting agenda and to approve the Handbook changes was approved 7:0. A motion to place the Code changes on the Consent Agenda for the August 21, 2018 Council Meeting was approved 7:0. 3. A presentation on the Sewer Metering Study (18-052) Presentation only. 4. A presentation on Utah's Housing Gap (18-070) Presentation only. 5. A discussion on a draft of the Environmental Assessment (EA), Land and Water Conservation Fund (LWCF) for the Timp-Kiwanis/Bounous property conversion (17-036) Presentation only. A motion to send the original [April Work Meeting] draft back to the Planning Commission was approved 7:0. 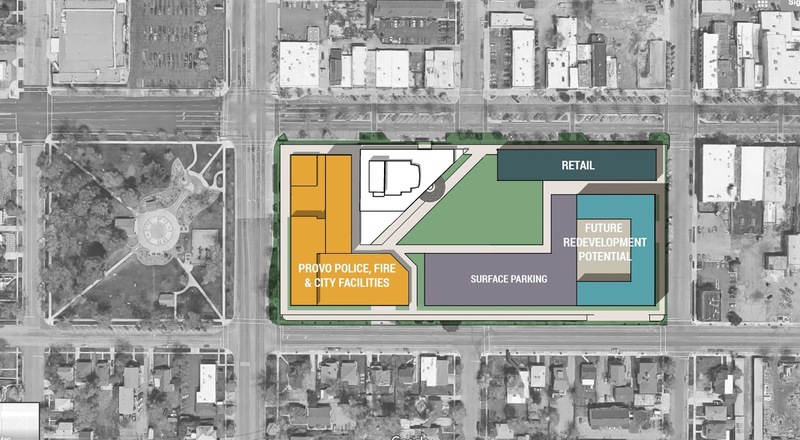 PROVO, Utah – August 8, 2018 – The Municipal Council voted unanimously Tuesday night to hold a special bond election asking voters to authorize a $69,000,000 bond, repayable over 20 years, "for the purpose of acquiring, constructing, and equipping in the downtown area a new police and fire headquarters, emergency dispatch center, and city hall; acquiring, constructing, and equipping a new fire station to replace the fire station on Canyon Road; and providing for related improvements in Provo City." An annual property tax to pay debt service on the proposed bonds will be required over a period of 20 years in the estimated amount of $119.80 per year on a $265,000 primary residence and in the estimated amount of $217.82 per year on a business having the same value. $265,000 is the median home value in Provo. The bond will be on the ballot for the General Election set for Tuesday, November 6, 2018. Ballots will be mailed to registered voters on October 16. 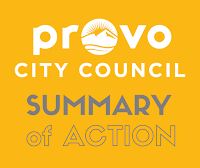 PROVO,Utah – July 19, 2018 – The Mayor and Municipal Council jointly make known their intent to address the critical space needs and deteriorating, unsafe condition of the current Municipal City Center and Fire Station No. 2 by asking residents for approval of a general obligation bond in the upcoming election. Currently, the City Center serves as the headquarters and operations center for numerous city services, including police, fire, and dispatch. The amount of the bond proposal remains to be determined, but will likely be between $44.5 million and $60 million, based on the three alternatives currently being reviewed by the Municipal Council and Administration. As elected leaders, we implore residents to get involved and assist us by providing input as we evaluate alternatives, which are: (1) relocate the City Center to the former Sears building in the Provo Towne Centre Mall, (2) upgrade and expand existing City Center facilities to meet necessary safety criteria and space needs, or (3) build a new and expanded City Center on the current block in downtown Provo. Thank you in advance for your input.